On their own and with their own hands to make repairs in the apartment. Let’s look at the entire repair process from beginning to end. Here we will discuss in detail the work with Paul. I must say that the repair in a rough apartment and apartment living is a little different than it is — read below. So, on their own if we decided to do repair, then first we will need this email. tool: hammer, screwdriver or drill, plochotnichenko or an angle grinder, jigsaw or saw. It can be said, the basis for any repair. Also will need a tool such as a spatula, Malka, the level is a small 60 cm (for tile) and a great 1.5 — 2 meters (the walls), the rule (an instrument for leveling the floor and walls), tile (for tile), attachments for mixer, metal shears, tape measure. Here you could go on and on but I won’t do that, because in the process of repairing the rest «trifle» can be purchased.When you got a tool, you can proceed directly to repair. What distinguishes repair in a rough apartment(apartment rented only in service) from apartment living? 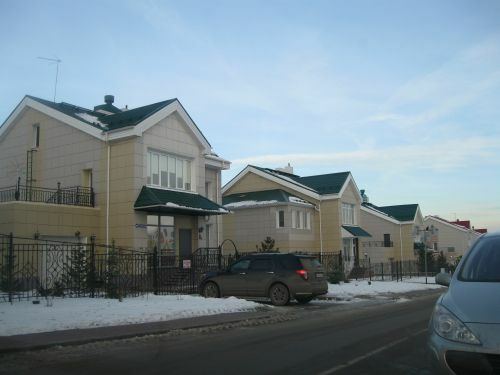 The fact that the rough flat usually without electricity, water, and perhaps even without internal walls and partitions. 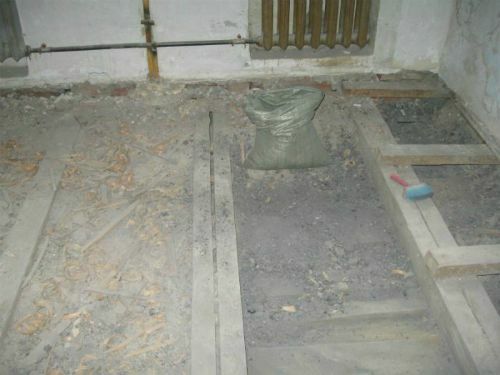 The floor is concrete, requires likely to a little clearing. 1. I am getting to the workplace, water and electricity. 2. Level the floor (if the floor is in one level throughout the apartment). If the floor is a different level, the level after the construction of the walls. 3. 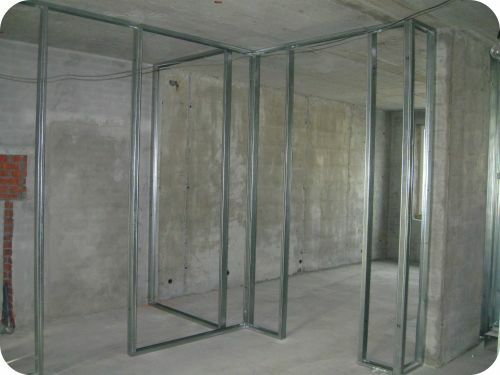 Erecting walls and partitions if they are of the foam or of the Cam plate. If part of the walls (ceiling) will be drywall, then lift them after plastering. If you build early, they may become impregnated with moisture from the evaporation of water after plastering, and subsequently drying start to crack (cracks). 4. If the apartment has lots of walls (ceilings) that are plastered, then you start plastering, and after plastering erect walls and ceilings. 5. Spread the electrical wires in the apartment. If the walls (and ceilings) will be plasterers, leads to better spread out before plastering the walls (and ceilings). The wires under walls and plasterboard ceilings laid after setting the profiles before screwing the drywall. Wires in the walls of the foam and Cam plate lay after their construction. 6. Walls and ceilings are finished and plastered. As they dry, into the floor (if it is at different levels in the apartment). Install the escutcheon. 7. Glue tiles in the bathroom and the toilet. Glue starting with the walls and finishing floors. Also glue the tile and on the kitchen wall (apron). 8. Putty walls and ceilings. If the walls and ceilings are completely dry after plastering, the plaster dries very quickly, one layer dries in 4-5 hours. 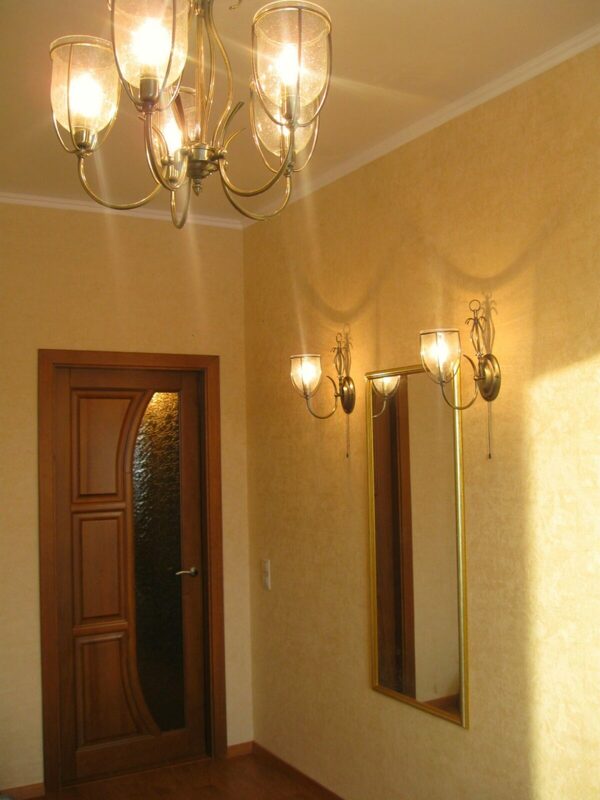 Putty walls on two of the ceilings in 4 times (twice by Vitanica and twice Sirocom or nivelinom). After drying grind. 9. Glue the tile on the floor (the floor had already dried up). Usually the tile is glued in the hallway and in the kitchen. 10. Install Windows and window sills. 11. Glue baguette (ceiling moldings), if the ceilings for painting. If suspended, the baguette is glued after pulling the ceiling. 12. Removed. Primed the floor and walls. Pull the ceiling if it is suspended. 13. Paint ceilings and walls (if they are paintable). 14. Stela laminate, linoleum, etc. Set the cores on the sockets and switches. Hang chandeliers and ceiling curtains. 16. Glue Wallpaper. Sets the frames for sockets and switches. Hang a wall of curtains. Install skirting. 17. Then comes the installation of the furniture. 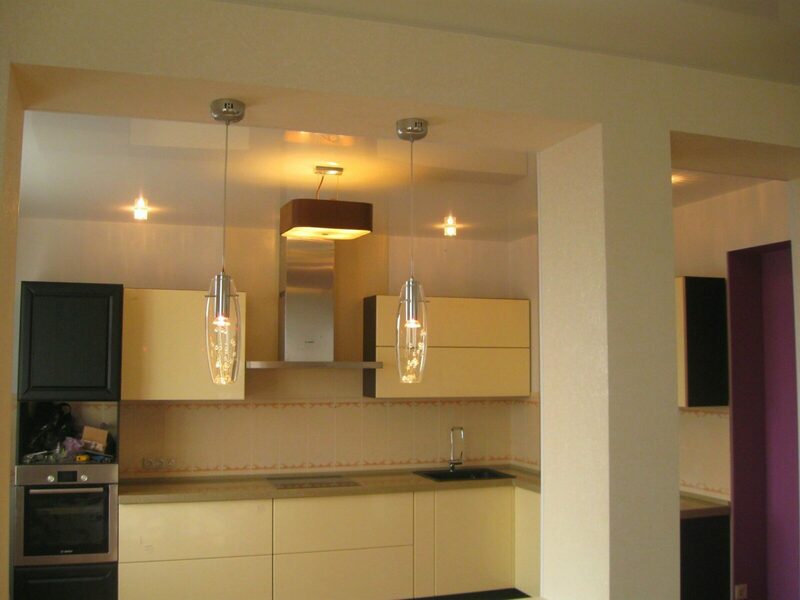 What are the characteristics of repair in a residential apartment? 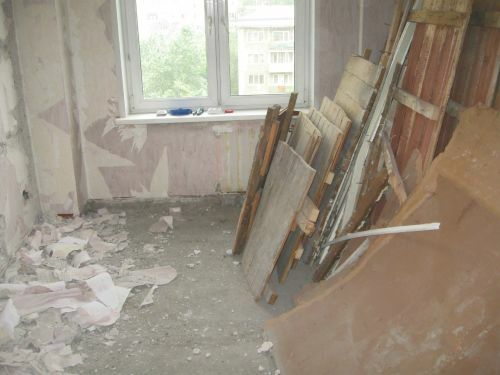 In residential apartment the walls are already standing, so there may be only small alterations. Electricity is already there, but as a rule, if you started a major overhaul, al.wires are laid over or partially. With aluminum wire changing to copper. Sockets and switches are transferred according to the European standard (socket 30 cm from the floor, the switch 90 cm). Risers and hoses in the bathrooms changed to a new one. In the riser pipe changed to galvanized, or wiring made of polypropylene, or of copper. The walls are trimmed to the base (take off old Wallpaper, plaster). Floor, if it hardwood, depending on the desires or clean up, or leave. Floors generally have the most difficulties, many just don’t know what and on what floor can be laid. Analyze all types of floors. Very often in our old Khrushchev and Stalin have wooden floors. Over time he begins to creak, and then the question arises, what you can do with him. Here are two options: either leave the floor and repair or open and remove. 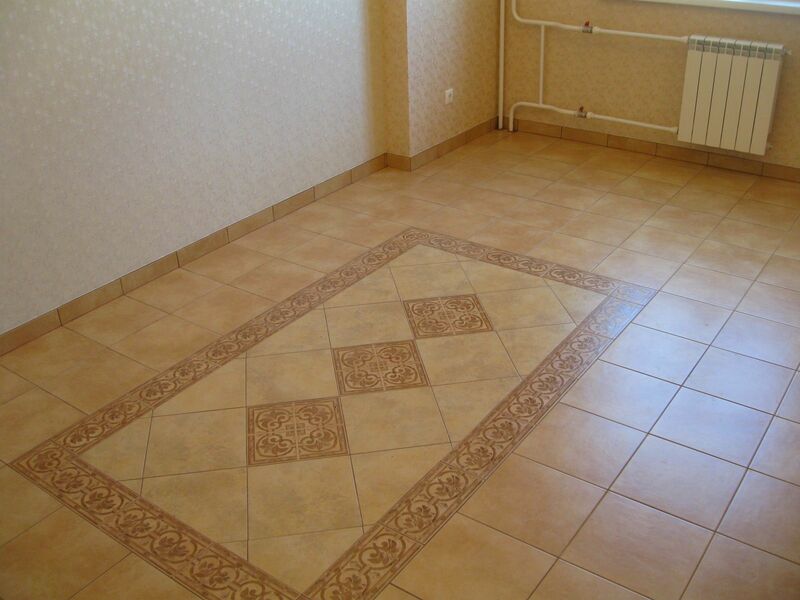 If repair, then in future it can or paint (varnish), or to lay linoleum (carpet, carpet, etc.). Likely to lay laminate flooring (parquet, cork, etc.) on this floor will fail because these materials when laying the floor level difference should not be more than 3-5 mm. Lay the tile is also unlikely, as from the boards he hotelcasa (due to vibration). In principle, tiles on a wooden floor plank you can, but then the floor must be filled by 5 inches solution. If wooden floors are out, then you have to align the solution (it is not clear how high). In this case, it is possible to stack any material, ranging from tiles and finishing the tube. Here, it is important to note that wooden floor in any case warmer than the floor is filled with, for example, a laminate. 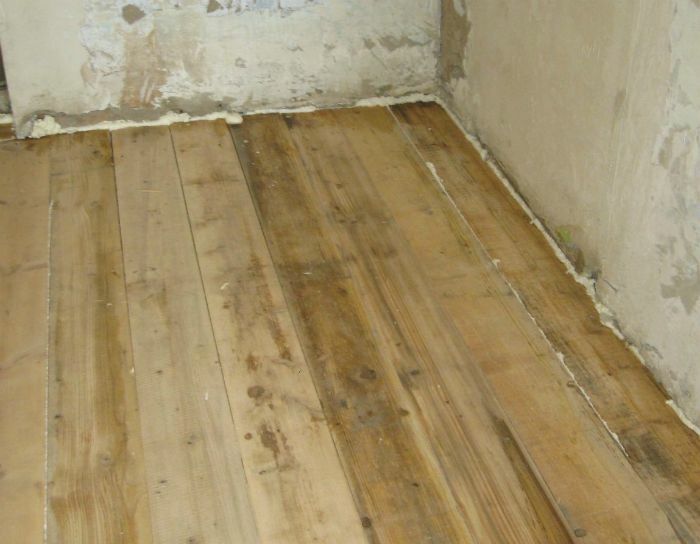 The first option.If you have decided to leave the wooden floor and repair (i.e. to remove the squeak, to refurbish the boards a bit to align). 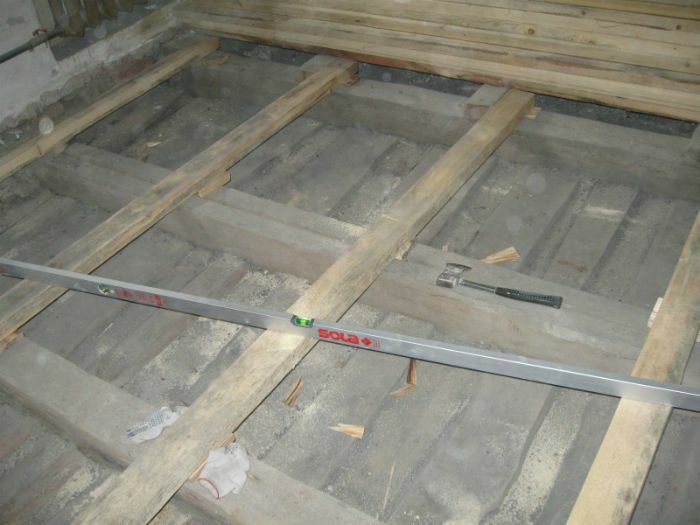 Floor squeaks or loose connection of the boards with the joists (nails, which nailed boards to the joists, loose), or due to lag, which loosely lie on the ground (concrete). 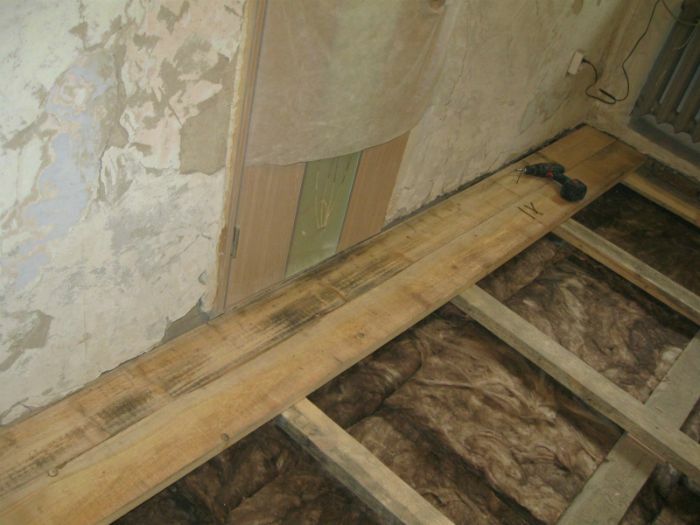 — The easiest option : repair without replacing the floor boards, it is the cheapest, but not always can help. 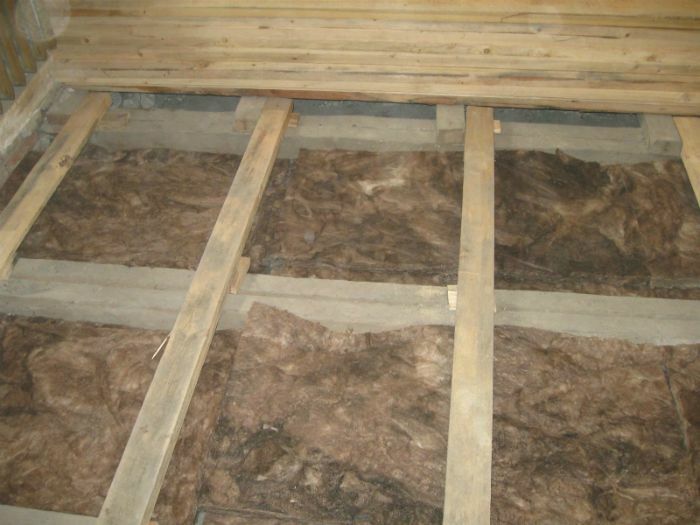 To remove the squeaking, you need brochurepath each Board onto the joists in place securing the Board. To know where to twist a screw, you need to remove all what is on top. Remove the cover, linoleum, hardboard, etc., so you can see the panels and their fixing to joists. In the place where the Board is nailed onto the joists, and screw the screws. On average, one Board takes 5-6 screws. The self-tapping screw to fasten the Board to the Arab League, should be about 2-3 times longer than the thickness of the Board. After all boards are screwed on, try to walk on the floor if some of the floors still creak, creak is not a Board, but she lag. In order to seal the joists with the floor, you need need to drill floor Board drill (diameter 8-12 mm) in place of the difficulty or near logs, insert in hole professional gun foam and squeeze the foam (about a liter in one hole or pressure 3-4 seconds). 1 sq/m floor need to do about the 2 holes, and possibly more, depending on the difficulty. After the foam dries, and lag prepelitsa to the base, the squeak should stop completely. — If the floor boards are not good, then they need to change. In this case, the old Board removed and new mounts. And, most likely will have to change themselves joists. If the joists are still in good condition, they are for insurance (in General as well as new ones) nailed to the base using dowel-nails. The dowel-nail must go in the lag and go into the base approximately 5-7 cm nailed Nails at intervals of 50-80 cm. Once the wooden floor is ready, it can be covered with paint or varnish. For even better alignment from the top it is possible to lay hardboard or plywood. The thickness of MDF or plywood depends on the irregularities of the floor, the greater the roughness, the thicker the material (average of 6 -10 mm). Plywood and hardboard, fastened to the screws. The screw length is 2.5-3.5 cm Screws screwed on the edge of the sheet approximately 7-10 cm and across the sheet. When screwing of the screws on the sheet, they apart need to back off about 10 cm on average, on a single sheet takes 150 screws. When plywood or hardboard screwed, you can lay linoleum or carpet, in rare cases, when a sufficiently smooth field (difference not more than 5 mm) you can take a chance to lay laminate. In the case when on the floor I decided to glue the tiles, wooden floors or clean up, or reinforced with wire mesh and pour a solution of at least 4-5 cm thick. 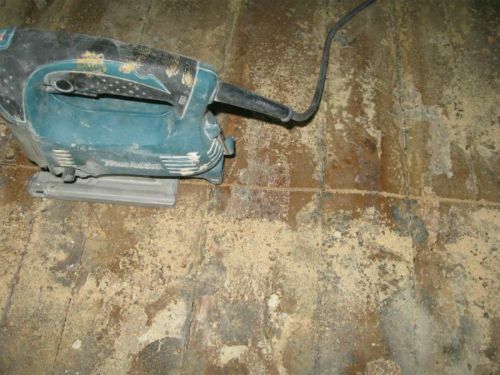 If you have decided to lay laminate and parquet, the wooden floor most likely will have to remove and start to «dance» from the concrete floor. On the levelled concrete floor can be laid in any of the coatings, but one of the biggest cons of concrete flooring that it can be cold. In these cases, doing a «warm» floors. Depending on the kind of «warm» floor it or laid in the screed when casting the floor or laid directly under the flooring. Once Paul understood, performed finishing work in about the same sequence as you would in an apartment with a rough finish. What kind of material (which the manufacturer) choose. Doing for quite long, I generally use mixes of the same manufacturers tried to save on material, but without compromising quality. In the process of renovation, I came to the conclusion that it’s not just the cost of materials, and proper substrate preparation (i.e. cleaning and lining). In the plaster of walls often use (price per bag of 30 kg of from 250 to 310 rubles): Rotgers, Rather, stucco XP — Start (manufacturer Knauf), plaster VOLMA Layer MN (manufacturer VOLMA). You fill the floor using a dry construction mixtures Hercules (screed for floor 25 kg 140-160 rubles, screed 25 kg up to 300 rubles). When gluing the drywall to the wall using adhesive Perlfiks (Perlfix) or fugenfuller. Use the following adhesives for tile: Hercules universal Hercules superpolimer, Kreps (price in the range of 180-210 rubles per 25 kg bag). Drywall is better to use only manufacturer Knauf. Well, a little bit about what it is impossible to save. When repairing the apartments in no case do not skimp on the plumbing and electrical. 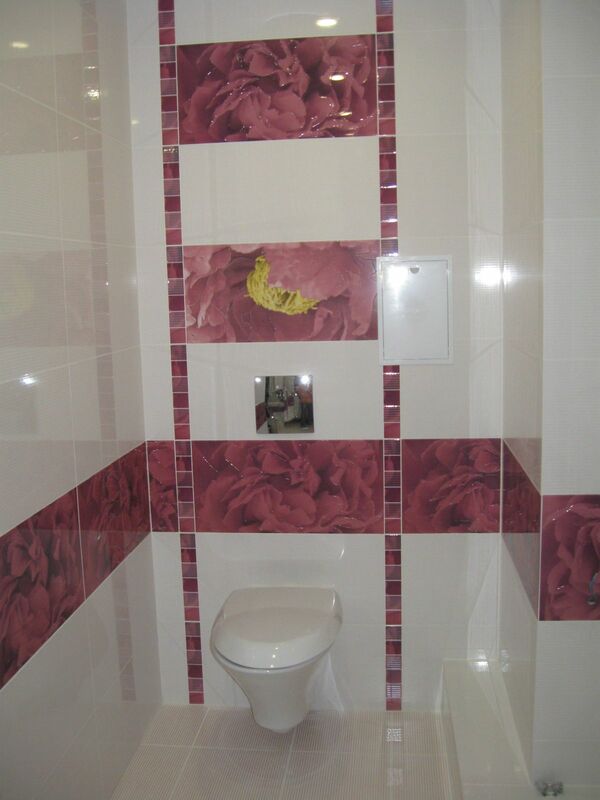 In plumbing work material and the quality of the work must be flawless. In this case it is better to overpay a little and find a good specialist than later to disassemble already made and taped to the tile box in the bathroom or the toilet. The same applies to electricians. It is very unpleasant to remain without electricity, when all wires plastered or hidden in the construction of plasterboard. ← Смета за ремонт квартиры в г.Абакане.